Seeing row after row of crosses and Stars of David at the American Cemetery in Normandy, it's hard to hear the individual voices of the men who lost their lives while fighting to liberate France from Nazi Germany. There are thousands of dead soldiers, each with his own story. 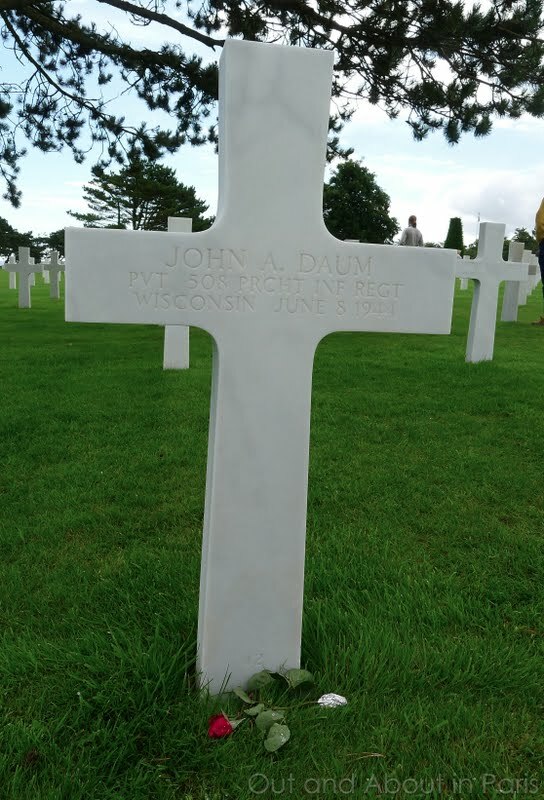 Here's the tale of one of them, Private John A. Daum, a paratrooper from a small town in Wisconsin. According to the testimony written by John's nephew, John worked for a farmer and at the Weinbrenner Shoe Factory in Marshfield, Wisconsin before enlisting. 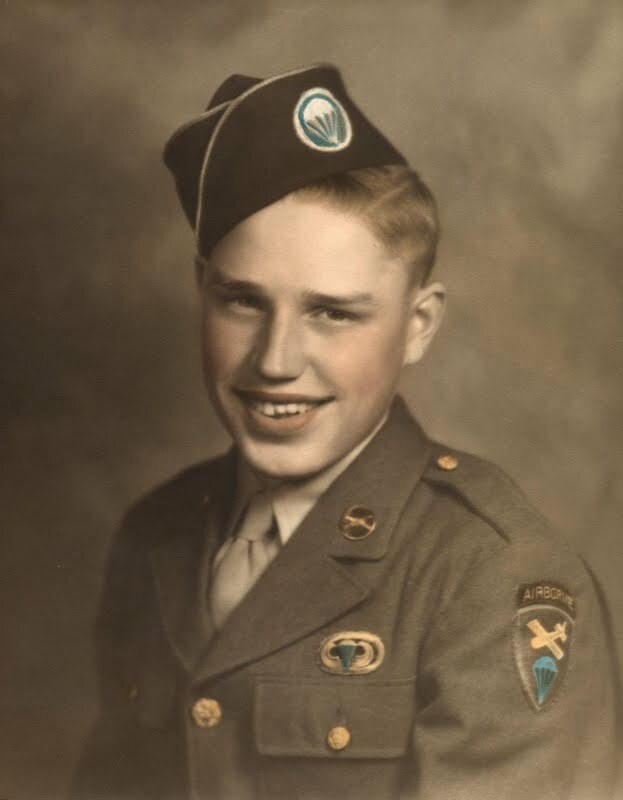 After completing his basic training at Camp Robinson, Arkansas, he joined the paratroopers. Letters home told of the daily five to ten mile runs and how he was taught to pack his parachute, to jump from towers and finally from a plane. In a letter to his father, John proudly mentioned that even though it was "really hot and a lot of soldiers were getting sick" that the "Daum blood kept him going." John received his wings on October 2, 1943 and joined the 508th Parachute Infantry Regiment of the 82nd Airborne at Camp Mackall. From there he traveled to Northern Ireland and then to Nottingham, England, where he said that there wasn't much to do except train and go to town. Fortunately, the young man from Wisconsin found the girls from England to be "nice". In the last letter to his family, John thanked them for the candy that they had sent and asked them to send socks. He told them not to worry and that he hoped to return to Wisconsin in a year. John never did return home. He was killed in battle at the age of 20. John A. Daum was just a regular guy. So, why did I pick him out of the 9,387 people who are buried at the American Cemetery? I didn't. But since I found myself fighting back tears when our tour guide read the following letter that a visitor left by John's grave in 2007, I wanted to learn more about one soldier, who just happened to be John, as a way of honoring all of the men and women who lost their lives during World War II. The following letter was written by a man from Saint-Symphorien, Belgium and was left on John A. Daum's grave at the American Cemetery. Our tour guide kindly gave me a copy of it. We don't know each other, we know nothing of each other's lives and even so, I feel I owe you so much. I know nothing of you or so little. I don't know what were your tastes, your hobbies, your favorite music or if you had a girlfriend back home. I don't know what you loved in life, your too short life. John, you've been buried here for over 60 years, in this land of France that saw your last days. These last days where you fought for the liberation of a country, a whole continent and a civilization. When I found your picture, I started thinking a lot about you, your face, your pink cheeks, almost the face of a child. Your smile tells me you must have been mischievous, cheerful and full of life. Then I felt a deep sorrow because I know that on that day of June 6 th, 1944, when you jumped into the cold black night on the Normandy beach, you must have been terrified. Terrified before the unknown, terrified at the thought of never seeing your family again, of loosing your army companions, of being alone, of death itself. Nevertheless, you survived that historic night and fought for two long days, before you fell on June 8 th. I wonder how were the last moments of your life, with who you were. From the bottom of my heart, I hope that you were not alone. Because I know that your comrade-in-arms must have done everything to protect you, reassure you and comfort you. I read the letters that were addressed to your parents when you passed away and realized that you were very much appreciated by your army companions. Before I leave John, I would like to tell you how much I am aware that your ultimate sacrifice and the one of thousand of men like you has allowed me and all of us, to live in a land of freedom and peace. For all of this, I am sincerely grateful. So, I promise you that every time I will travel to Normandy, I will come visit you to honor your memory. I will lay my hand on your white cross, so that you are not alone in the dark anymore. I will keep your memory alive in my heart and I will never forget what you have done for me, for our liberty, for all of us. See you soon and may god bless you. The average age of the soldiers buried in the American Cemetery is 24 years. The families of 60% of the 30,000 American soldiers killed during Operation Overlord decided to have the bodies of their loved ones repatriated. Others, like John Daum's mother, did not bring the body of her son back to the United States "because a neighbor had brought her son home for burial and it was like losing him all over again....Plus, Bud [John] was resting where they had buried him." John's body is buried in Plot F, Row 23, Grave 42 in the American Cemetery in Normandy. While it's distressing to see the graves of so many young men, the American Cemetery and Memorial is a beautiful tribute to the soldiers who lost their lives. If you're going to visit Normandy, be sure to schedule enough time to see the excellent exhibits in the Visitor Center, to walk through the cemetery, and to watch the film, Letters. Free guided tours are offered in English at 11:00 a.m. and 2:00 p.m. during the summer and at 2:00 p.m. during the winter. For additional information, please visit the official website of the American Battle Monuments Commission. 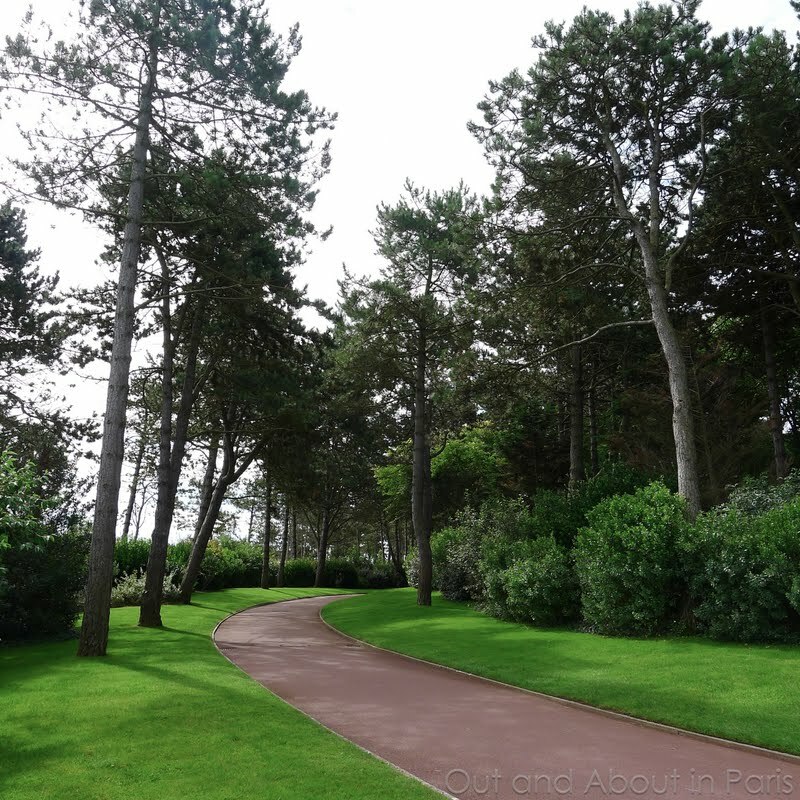 This is already a long post, but I'm including some more pictures just in case you don't have the opportunity to travel to Normandy to visit the American Cemetery. [Edit] After publishing this post, I discovered that there is additional information about John A. Daum in the section marked "Photogallery" on the website for the 508th Parachute Infantry Regiment. Please take some time to visit "the Home of the 508th Parachute Infantry Regiment - the famed Red Devils of the All-American Division in World War II." If you live near Normandy, please think about "adopting" a soldier. A French couple founded Les Fleurs de la Memoire, an organization that encourages French families to put flowers on the graves of the soldiers buried at the American Cemetery. Many thanks to Sally Byrne for telling me about her adopted soldier, 1st Lt Frank Trippensee from Missouri. Heidi, I know - I can't imagine what it would be like if Philippe was fighting in a foreign land. The thought crossed my mind many times, both at the American Cemetery and at the German Cemetery. I read a report from a 23 year old American officer who said that he was an "old" man compared to the 17 and 18 year old boys under his command. Give your sons a hug and be thankful that they are nearby and out of danger. That's what I kept doing to Philippe yesterday. It was also very meaningful for Philippe to visit the cemetery and to realize that it was men his own age who fought in the war. The average age of the soldiers buried in the German Cemetery is 21.
that's wonderful of you to write that for us. Many thanks for your comment. I sincerely hope that people will visit your website and read about the other men in the 508th and perhaps "adopt" one of them like Yvan, the Belgian man, did with John. There was a single red rose resting on John's grave and I couldn't help but wonder if it was left by Yvan or by someone else who heard John's story during a previous visit to the American Cemetery. P.S. I just discovered that there is an album with additional information about John on your website. I'm going to include a link for it in the blog post. Fascinating an very moving blog, MK...Interesting to see a single Star of David in a the cemetery shot, proving once again that on the battlefield and in death we are all equal. When I was trying to decide between two photos for the beginning of the post, I felt that I had to go with the one with the Star of David even though the other picture was shot at a better angle. Thanks for noticing it. 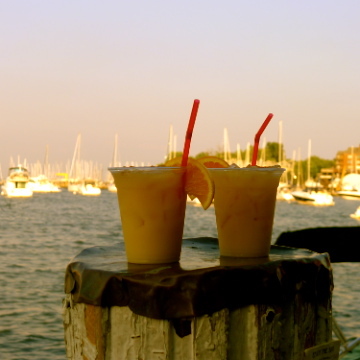 Great blog Mary Kay. I live in Normandy and we were at the cemetery to la flowers on the grave of our "adopted" soldier, 1st Lt Frank Trippensee from Missouri. He was 29 years old and died on 29th July, liberating our village just south of Saint Lo. We could find very little about him other than he was married and had a sister and his dad too died at the age of 29, in 1918 and I often wonder if he was killed in the 1st world war. You can officially adopt a solder at www.lesfleursdelamemoire.com 8,500 of the graves have now been adopted. On 4 July the association asked people to leave a single rose on the grave of any soldier who has not yet been adopted. Frank Trippensee was my great uncle. I never new him but he was my dad's uncle (maternal side of the family)I want to come to France to pay tribute to him and just wanted you to know how incredible I think it is that you adopted him. Frank Trippensee was my uncle. His mother was Minnie Edna Trippensee and his Father was Victor E. Trippensee. His sister (my mother) was Dorothy Lorine Trippensee Dulle. Dorolthy passed away in 1969. His father Victor died in the 1929 outbreak of the flu. Edna passed away in 1977 at the age of 86 after outliving her husband and both children. Your generosity and caring is appreciated more than you can ever know. Thank you so much. Thanks for telling me about Les Fleurs de la Memoire. I'm going to include the link in the post so that people can click on it and visit their website. I was truly touched by how the people of Normandy feel about the soldiers. The official guide at the American Cemetery told us of how she grew up visiting the cemetery with her school and how it became a part of her life. So much that she works there now. While I was standing at the cemetery, surrounded by the graves of those who died, it was comforting to know that they are still remembered. I wish that all Americans could visit the cemetery where they would see that men like "your" 1st Lt Frank Trippensee and John Daum are not forgotten. Our tour guide told us that the people of Normandy have always felt a great deal of gratitude to the Allies even though 18,000 (I never knew that!) civilians were killed during the bombing raids. Did you pick Frank because he died while liberating your village or did the Fleurs de le Memoire suggest that you adopt him? 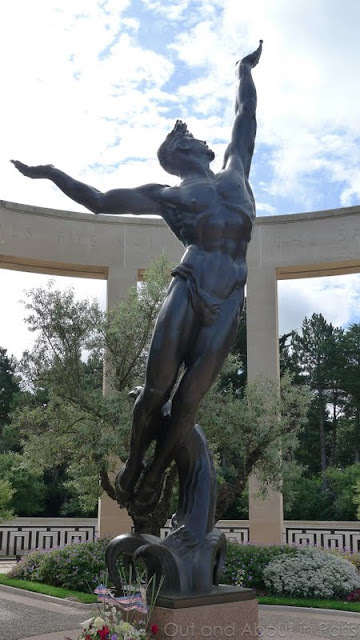 Maddie, The American Cemetery is in Colleville-sur-Mere. We stayed in a B&B that was halfway between the beaches and le Mont St-Michel. But after visiting Bayeux, which is a lovely town that wasn't destroyed by the bombing, I told my husband that we should stay there the next time that we go. Plus, we saw the famous Bayeux tapestry (post coming soon). Are you planning to take a tour when you're in Normandy? Because then I would say to stay wherever your starting point is. I'm not sure but my impression is that it would be difficult to get from one village to another with public transport. There is a Normandy forum at TA and the people who are more familiar with the region would be able to tell you what would be best. We did a full day tour with a private guide and visited the German Cemetery, Ste-Mere-Eglise, Omaha and Utah Beaches, and Pointe du Hoc. If you're able, I would recommend doing a bit of research about one soldier (perhaps at the airborne website that is linked above) and visiting his grave while you're there or perhaps visit John or Elizabeth's grave. Their headstone locations are noted in the post. You may want to take a flower....I wish that I would have brought 9,387 with me. When I went to Normandy in 2009 we stayed at 2 places. The first was with Hand Maid Tours owned by John & Elaine Flaherty. It was in a 300 year old house. All lodging, food and tours were included in the pricing. The second was the hotel 6 juin in St. Mere Eglise. This small family owned hotel is within blocks of the church, Airborne Museum and temporary Cemetery which is now a soccer filed. It is also about 5 miles from Utah Beach as well as where most of the famous paratrooper battles were fought. My husband, our 21 year old daughter and I had the opportunity of visiting the American Cemetery while we were on a tour to Normandy & Brittany in early August. It was a particularly sunny day with clear blue sky & gentle wind blowing from across the English Channel. We saw the exhibits in the Visitors Centre as well as watched the film, Letters. It was a very moving film & It stirred the emotion in us. We saw people discreetly wiping tears off their eyes & when we left the hall, all faces looked so sombre. We did not join the free guided tour but we walked through the cemetery, appreciating the well kept cemetery, the scenery & spent few moment in silence in respect to the many brave men & women who, at such young age, left this world. We came from the other side of the world & eventhough we knew little about the history of Normandy, the day trip has touched our hearts. Our thanks to you for your wonderful post. Mary Kay, this is just wonderful. His family must be so proud, and you and Yvan have ensured that his memory lives on to a wider audience, which is also a significant act. I only spent an hour at the cemetery but of all the places I have visited it is this one I remember most clearly. As you say, John's story represents all those brave souls who rest with him. What a man he was, they were. I look forward to your follow up. I will return one day and pay proper respect to those who sacrificed everything for us all. Tom, Thanks for the helpful suggestions about where to stay in Normandy. We really enjoyed our short visit to St Mere Eglise and wished that we would have had more time there. It's definitely a good location to use as a base for exploring the area. KBgal, Many thanks for reposting your comment here! As I said over at TA, I think that there's something about visiting the American Cemetery with our own children who are the same age as many of those who died that makes it even more poignant. I felt very thankful to have my 21 year old son next to me...alive. Unfortunately, there are still too many mothers in the world who can't say the same thing. My heart goes out to them. Tony, Hearing the sounds of the German gun battery on your YouTube video sent shivers down my spine. The beaches were so quiet while I was there that it's important to remember that it was an entirely different scenario during battle. Thank you for including the link. I hope that people will have the opportunity to watch it! I was at this cemetery exactly one year ago. Thank you for the link. I was also touched. Yes, their ultimate sacrifices allowed us to live. We should always remember this. I was only 12 when John was killed, living near Moscow. Ludwik, Your surname name gave me a bit of a jolt because my mother's maiden name is Koalska. It was Koalski (alternatively spelled Kowalski) but one of my ancestors was misunderstood when he spelled his name for the census officer. As far as I know, there aren't that many people with that surname, although maybe I'm mistaken. Life couldn't have been very easy in Moscow in 1944. You must have a lot of fascinating stories to tell. While we were touring Normandy, our guide kept telling us how pleased the German soldiers were to be there prior to D-Day rather than at the Russian front. Ludwik, In my excitement about your surname, I forgot to say "thank you" for posting. I just took a look at your blog and see that you have written about your past. I look forward to exploring your blog further. Thanks again. Somebody necessarily assist to make seriously articles I'd state. That is the first time I frequented your website page and up to now? I surprised with the analysis you made to make this particular publish extraordinary. Excellent process! My family and I visited this very sacred place a few years back and believe me it takes your breath away. The cemetery is on very sacred ground which is considered part of the United States. It is supervised by one American officer and a staff of french citizens. If you ever have the opportunity to go to the American Cemetery please do. As you walk through this sacred place you can almost hear the battle that took place decades ago and believe me your breath will be taken away as you star out at all those brave men and woman buried there.